This summer I published an article on 475's website discussing the benefits of using Intello with specific focus on Energy conservation. While there are many benefits including breathability, red list compliance, non toxicity, vapor control without relying on paint, having a continuous air barrier on the inside of your insulation can virtually double the performance of any envelop system. Waterproofing, moisture control, breathable membranes, non toxic, healthy, sustainable and affordable are a few topics for which there are no answers. While there are solutions for some, these are all complex problems which all too often aren't' considered by architects and builders. The same building with Intello on the interior will perform at 80%, more like R-17. air barrier that keeps vapor out of your building cavity but still breaths. Based on my personal experience in these buildings, I am absolutely convinced that the thermal efficiency of our MicroBuildings doubled by applying Intello smart air barrier to the interior. One other advantage is that the intello encapsulates the wall cavities not only sealing warm air in but keeping the insulation dust out. While I'd love to use wool insulation on all my projects, it is not as easily obtainable and certainly costs more and while I'm not at all in love with fibreglass, I feel better knowing it's safely sealed behind my non toxic Intello air barrier. This also means I can use real wood as an interior finish without milling it into T and G or painting it for a vapor barrier. Salvaged wood over Intello air barrier on one of dbBrad's microbuildings. For more on smart envelop construction and a multitude of membranes for virtually any application, go to 475 Building Products. Wallawas, Oregon, GreenTrails maps, Amazing. All totalled, Yessi and I hiked about 400 miles over two years in the Wallowas. They are a beautiful mountain range with amazing hiking. From the major highway they look simply like foothills and as you head up into them it's hard to imagine there will be steep granite cliffs, hidden valleys, snow covered peaks and pristine mountain lakes. Yessi plans our mapping adventure. Yessi and I are now on our 5th year hiking for GreenTrails maps. Every year we get sent to some place wonderful and every year where our only task is to find and hike the trails. Yessi and dbBrad show off our GreenTrails hiking jerseys. How we start? We gather what maps we have, our camping gear, our GPS units and start driving. We head down initially hoping to find access, trail heads, resources and plan our outings. This usually takes a couple of days and then we start hiking. At some point we run out of time and return home to plan our next trip. Somewhere in the Wallawas near Eagle Cap. In 2015, Yessi had to stay on Whidbey for work and so I went hiking with Ed and Benton. Ed did a couple of amazing hike with me including a 18 mile day that took us up over 6500' where we saw substantial snow on a beautiful July afternoon. In 2016, yessi also had work and so I hiked with Ed supporting me and Benton on the trail. Thanks so much to both Ed and Benton for the support, the patience, the route finding nd the company. While this may seem easy, quite often we are in places where the trails have been abandoned or are just so overgrown that we can't find them. Places where roads have overgrown to become trails. This is one of those places where the trail is overgrown and or missing and you just have to wing it. Places where new roads have gone in disrupting the trails. In late july dbBrad, Ed and Benton encounter a snow storm up at 6500' in the Wallawas. Somehow Benton managed to stay on the trail even though Ed and I couldn't see it. Places where fire has ravaged the land leaving no trees, no brush and no trails. In places like this, trails won't happen again until the landscape repairs itself and plants get large enough to warrant trail as well as to hold the trail. Without plants, its very difficult to define a trail. Benton, the worlds cutest Aussie, wondering why Ed and I are hiking so slow. Benton carried a GPS this year and I wasn't surprised that he hiked twice as far as I did. If you look at the back of GreenTrails Wallawa map, you will see Benton credited for his assistance! Places where the sale of property has let to the installation of locked gates restricting access to know trail heads shown on old maps. one never expects quite this much snow in the middle of Summer. And sometimes you just can't find the trail because of the snow, new or old. Brad and Benton loving life, just hours before it started snowing. Sometimes there are new trails. These are always a challenge too as we like to plan our trips to be as efficient as possible. When you're hiking and then you come across a trail that's not on your map, you have to follow it. trail here and the maps were totally wrong in this area so we had to wing it. Fortunately we found a Kern at the top of the hill indicating we had found the trail again. In this case, the trail not being on the map is a total surprise. This is great but also a challenge as we can walk several miles to end up who knows where since it's not on the map! Benton and Brad followed an unmarked spur up a creek to the most amazing hidden Lake I've ever visited. Because we were at the end of a 50 mile loop and out of food, our visit was short. Sometimes were erroneously follow a game trails. This year I missed a turn at a creek where the trail followed the topography around the mountain. dbBrad and Benton high in the Wallawas. Having not seen the crossing and trail on the other side, I just kept walking. It was about 1500' vertical when I came to the top of a ridge that I wondered if I'd made a mistake. A beautiful natural Meadow deep in the Wallawas. I thought I was headed into valley with a lake. When I checked my map, I saw I was indeed headed to a lake. So why was I climbing? Yessi climbing over a tree in the trail. I've been to a lot of mountain lakes and a lot of ridges, but I've never seen a lake on a ridge. Yessi and dbBrad high in the Wallawas carrying a balloon we found. Upon closer inspection of my topographical maps and my gps, I saw that I was indeed about 1500' higher than I was supposed to be. Yessi and Brad climbing into a thunder/lightning storm and getting a little anxious at the lack of cover. So I turned around and went down, keeping a keen eye out for the trial I had missed. Believe my frustration when I reached a trail junction, one I had already mapped that was before the creek crossing. One of the many wonderful lakes in the Wallawas. I had missed the trail twice now. This time I was 600' below my turn off and had to start climbing again! Yessi, the worlds cutest hiker. At this point, when your 50 miles from your car, are relying on a trial to form a loop back and have failed to find a trail for a while, it's easy to get a little anxious. What if I cant find the trail and I have to turn around and go back? Do I have enough food? How will I get to the trails over there (otherside of missing trail) to map them? What if there is a trail and I miss it and then it doesn't get mapped? All these thoughts can add a bit of stress to what should be a totally stress free activity! rivers and snow covered peaks in the background. I was able to find the trail and the creek crossing, finally, and resumed my mapping after hiking two more hours, a couple extra miles and almost 2k extra vertical. is an easy way to drop 4 pounds. It turns out that because there are quite a few horses in the Wallowas. This with fallen trees which for the horses to cross the creek meant taking a different path. I followed the horses since it was where the dirt was torn up and looked like the trail. Yessi and Heart Lake in the Wallawas. But following the horses across the creek left me with no trail to follow. It was the third time around after passing it twice, when I was finally able to find the 'real' trail on the other side of the creek. Yessi in the Wallawas by one of the many wonderful lakes. This is so similar to many of the days we have hiking and mapping. But it makes for lots of fun, adds a bit of challenge and sometimes leads to the most wonderful lake or ridge or valley that I never would have gone too if not on assignment. great surprises one can enjoy while hiking. Benton, world's cutest Aussie and GreenTrails mapping expert. 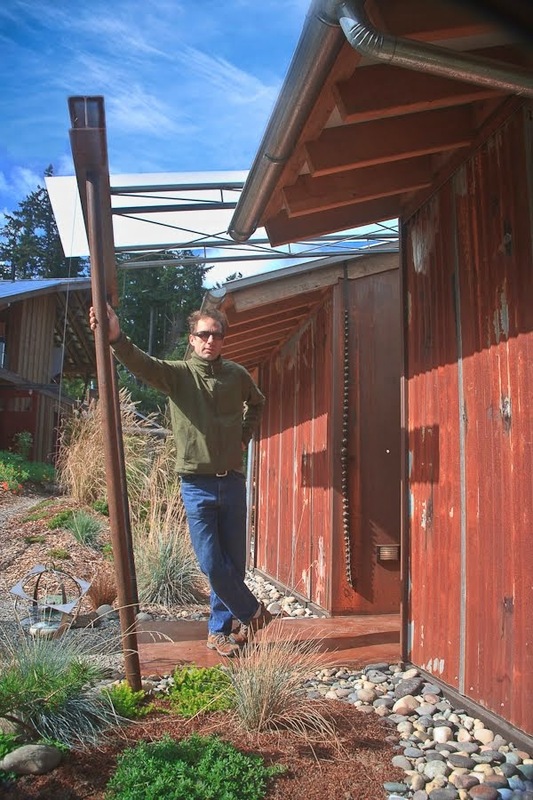 The Whidbey Institute is enlarging its accommodations for guests and as such hired Ross Chapin to design three new buildings called Meadow Row. dbBrad was hired by Jade Construction to help out with the building, detailing and moving of the microbuildings. Dan Neumeyer of Jade Construction was hired by the institute to build the buildings. Dan has built and even moved some small buildings but this was a big project and so he turned to us at dbBrad to help out because we have built so many Micro Buildings and have extensive experience with picking, moving, placing, designing and building small buildings. It was all in all a very collaborative process between Dan, Scott and Mike who work for Dan, Ross the architect, and myself, Tristin, Josh, and Kevin. All in all we worked well together, had lots of fun, kept up with Dan's schedule, and did some amazing on the fly problem solving. dbBrad logo cut out of Tar Paper, our only publicity on this project! Because building comes with lots of noise and disruption, the choice was made to build the buildings off site and move them onto the site when they were mostly complete. be joined into one once on site. This came with many challenges. The first being that each building consisting of two bedrooms with a common bath in between, would have been too big to move in one piece. Rather, the structure needed to support them during the move would have been so substantial as to add enough extra height to the building that when loaded on a truck would have been overheight. We left just enough space between each building to allow access for labor and materials. Overheight may not be an issue in some places and you can get overheight permits, but on Whidbey Island where many of our power lines are low, extra attention needed to be paid to which route had the best clearance and not to exceed this. Twelve Micro buildings going up together. The decision was made to separate each building into three. Thus the bathroom and the two bedrooms would each be build as a separate pod and then joined together on site. dbBrad sign also visible on one of the pods. This is much more complicated that nailing up a piece of trim to cover the seam. Probably the hardest thing to deal with was the wiring. However Island County insisted that these small residences were commercial in nature and as such had to be sprinkled for fire protection. This seems absurd to me to spend 10's of thousands of dollars so each of these 8x12 buildings could have a sprinkler head. Framing the roofs while issues with the ADA units were resolved. So right next to Hanson's, my favorite lumber and hardware store, is a lot that used to have cranes on it. Dan was able to rent this lot for 6 months and use it to build and stage the buildings. not from materials used to construct and finish, but from the design. Temporary platforms were built consisting of 4x10 beams roughly 10' apart that we could build on allowing us to level, have access under, and later to pick with a crane or forklift. Having Hanson's right next door was quite handy. When we needed materials, we simply walked over to the counter, placed and order, found one of the yard persons with a forklift and had them bring our materials to within a few feet of where they were needed. dbBrad recommended the Pro Clima system from 475 building materials. toxic, it's like gortex for your house. Dan put together a schedule and did a fantastic job. The overall offsite construction which also included foundations and utilities on site, was about a 5 month project with framing making up 2-3 weeks. The crew, Scott and Mike of Jade construction and Kevin and Josh of dbBrad. Where the hell is Tristan?! Not the first time I've said this! We were able to complete the framing in this two weeks. Amazingly enough, the buildings scheduled to move the first week of November were moved to first week of November. I give Dan Neumeyer great credit for this. To build and complete 12 complicated microbuildings and keep to the 5 month long schedule delivering the buildings on the day projected was quite an accomplishment. the pre-made soffits which were built on the ground. View of the MicroBuildings and simple shed roofs from above. for the front have already been installed after being assembled on the ground. until it was time to move them. Rainscreen, Roxul and siding going on. Plastic installed to keep the buildings dry until they were ready to be moved. Other walls had to remain unfinished until moved into place.